Day Thirteen of the 30 Paintings in 30 Days and I decided to have fun with some items that begin with the letter 'F, namely "Froot Loops, Flamingos, and Film". I had fun with this fanciful scene and the bright colors. The flamingos are little rubber miniatures that sit on my shelf above my computer. I began by painting the bright Froot Loops container and the film envelope in the background. The pieces of cereal were interesting to try and mimic the texture and not make too round or perfect. I like their reflections in the film strips. 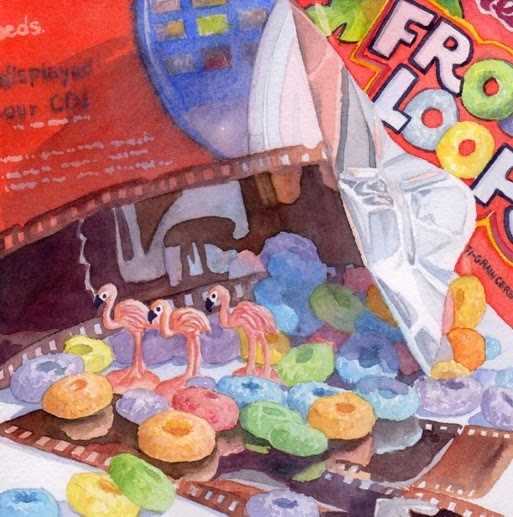 "Froot Loops, Flamingos, and Film" is a 6"x6" watercolor and it is available on Daily Paintworks for $150 (framed). Click here to purchase.